Beyond using sunscreen on a daily basis (it’s a big nonnegotiable for me), one beauty rule I always follow is to always have hydrated lips. It’s why I’m not the biggest fan of matte lipstick formulas that leave your lips looking dry and cackled. Sure, those are the ones that tend to have incredible staying power, but I refuse to wear them just for the sake of having a color stay on my face for an entire day without having to touch up. I’d much rather have to reapply whatever lip product I’m wearing multiple times throughout the day than look like I haven’t used lip balm in ages. While I’m not a high maintenance person (my daily night and evening skin care routine typically takes less than 5 minutes on average), I do have quite an extensive lip care regimen. I use a lip scrub two times a week to gets of dead skin, which, in turn, makes my lipsticks goes on smoother and look better. On top of that, I’m also a big fan of lip masks. Yes, you read that correctly. These days, you can find masks for literally every part of your body, including your lips. Similarly to face masks, they hydrate your lips on a deeper level than your average balm or save — and some even temporarily plump your lips so they look fuller without having to go down the route of getting injections. Lip masks have been really big in Korea for the longest time, but it wasn’t until the past two years or so did they gain mainstream attention and popularity the beauty world in the West, primarily thanks to the likes of Kim Kardashian and other mega-celebrities documenting their experiences using them on social media. At one point, they were all over your Snapchat and Instagram feed. While the hype surrounding them has died down a bit, they are still widely praised in the beauty community for how effective in giving you an incredibly moisturized, soft, and plump pout without surgical intervention or much effort, really. 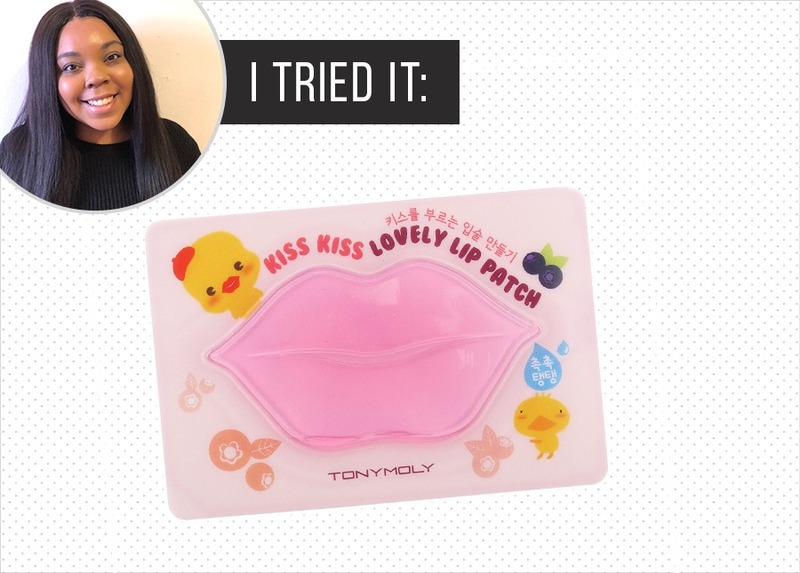 One such lip mask that is all the rave is Tony Moly’s Kiss Kiss Lovely Lip Patch. I mean, actress Jessica Alba swears by it after a friend introduced her to it, according to an interview she gave to Elle. Considering the reviews it has gotten over the years, naturally, I had to give it a go myself to see if it’s a miracle worker as people say it is. As far as the packaging goes, I can’t lie, the lip patches do look a bit silly, though they make for a funny selfie. They are pink and shaped like a ridiculously big lip and have a jelly texture. A set of two costs $9.99, which, all things considered, isn’t the most reasonable price since you can only use each patch once. When I went to try it out for the first time, it wouldn’t stay on my face no matter how much I tried. It kept slipping off my face, presumably because it was completely doused in a serum that’s supposed to hydrate your lips. Even titling my head back to keep it in place a bit didn’t work. So I threw away the first one and proceeded to use another one because hey, sometimes you’re unlucky and get default version of an otherwise good item. To my disappointment, the second patch I tried ended up being a slippery mess, too. Ultimately, it was a major fail, which is too bad since I’m otherwise a fan of the Tony Moly brand and lip masks in general. I just have to clearly stay away from this particular product.